Addis Ababa (HAN) July 22, 2014 – public diplomacy and Human right issues news. The British Ambassador to Ethiopia Greg Dorey said the consecutive economic development registered in Ethiopia over the past years is “very impressive”. In an exclusive interview with Ethiopian News Agency, the British Ambassador said the development in Ethiopia is “very impressive” and “potentially sustainable” as well if the government continues to take the right decisions. The economic growth in Ethiopia has been accompanied by a huge social investment in human development. The British Ambassador to Ethiopia Greg Dorey appreciates the strides that have been taken in improving the health, education and social wellbeing of the people. “Ethiopia is still a poor country so that work needs to continue.” he added. The British Ambassador to Ethiopia Greg Dorey expressed hope that the economic growth in Ethiopia will continue to benefit the people through job creation and sustainable development. 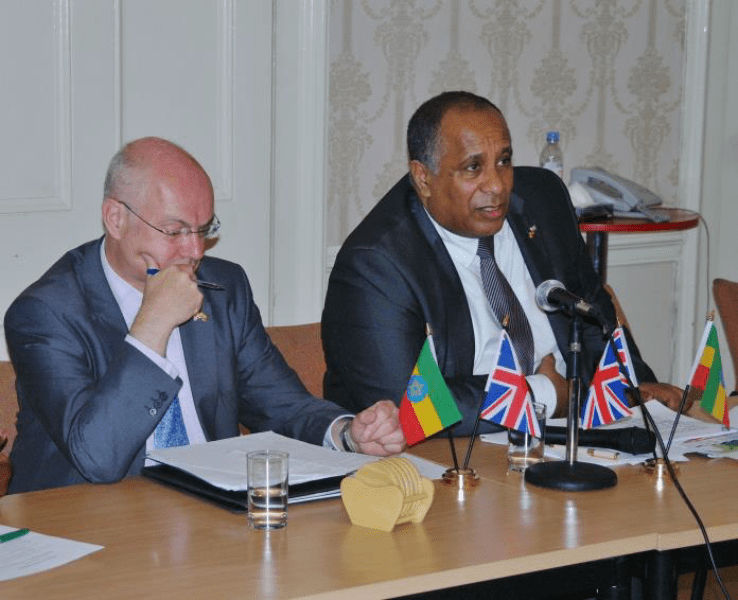 The bilateral relation between Ethiopia and UK is ‘very diverse, mutually beneficial and very good,’ according to the Ambassador. UK provides over 300 million pound sterling annually to Ethiopia in connection with development programs. Trade and investment relationship is also taking off from a ‘low base’. UK imports of goods from Ethiopia have grown by 48 percent from 48 million pound sterling in 2009 to 70 million pound sterling in 2013. In the same period UK exports to Ethiopia have also grown by 29 percent from 77 million pound sterling to 99 million pound sterling. Climate change is one of the areas where the two countries are working together. The Ambassafor recognizes the efforts of the government to create a climate resilient green economy by 2025 and achieving a middle income status with zero carbon emissions. The British Ambassador to Ethiopia Greg Dorey said the Climate Resilient Green Economy Policy of Ethiopia can be a model to other countries. Geeska Afrika Online (1985 -2014) – The International Gateway news and views about the Horn of Africa (Ethiopia, Eritrea, Somalia, Somaliland, Sudan, South Sudan, Djibouti, Kenya and Uganda), the best IGAD news and information Online Site for the last 20 Years. it is an impressive expression and timely stated article about my country Ethiopia. Ethiopia: Who’s reporting Africa now? South Sudan: Let’s make peace, NOT WAR! Ethiopia: Why Tigray state president is resigning?